A few weeks ago I went to Bicester Village for a shop, in partnership with the village. 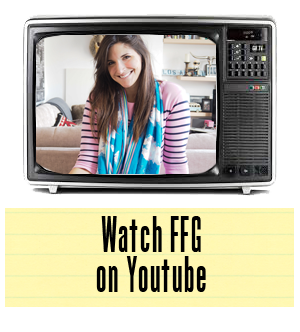 While in residence, an idea was born concerning a how to style piece. I tripped upon the perfect trainers in Saint Laurent and found myself thinking, "can I actually pull these off?" 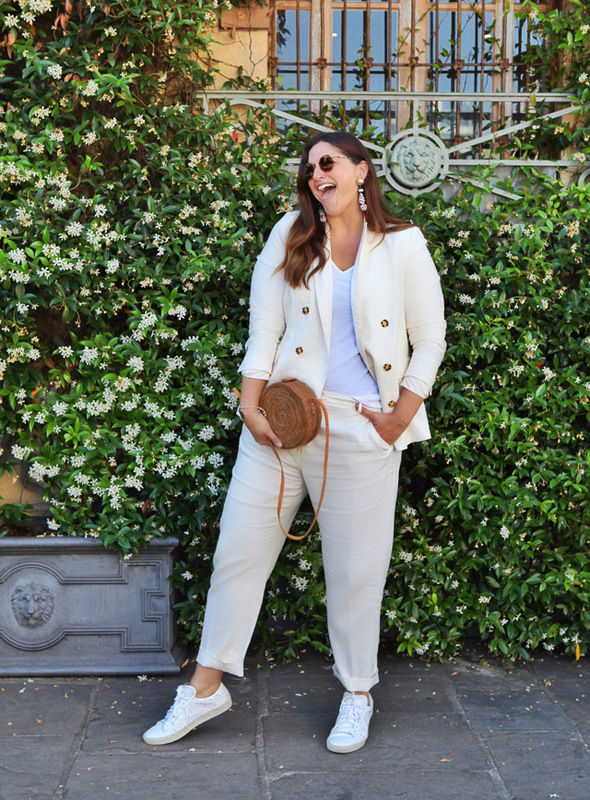 Women all over the world are embracing the trend of hiding the heels and trying on the trainers with everything from black tie looks to workwear ensembles, so I thought I'd give myself a little challenge and it goes something like this. 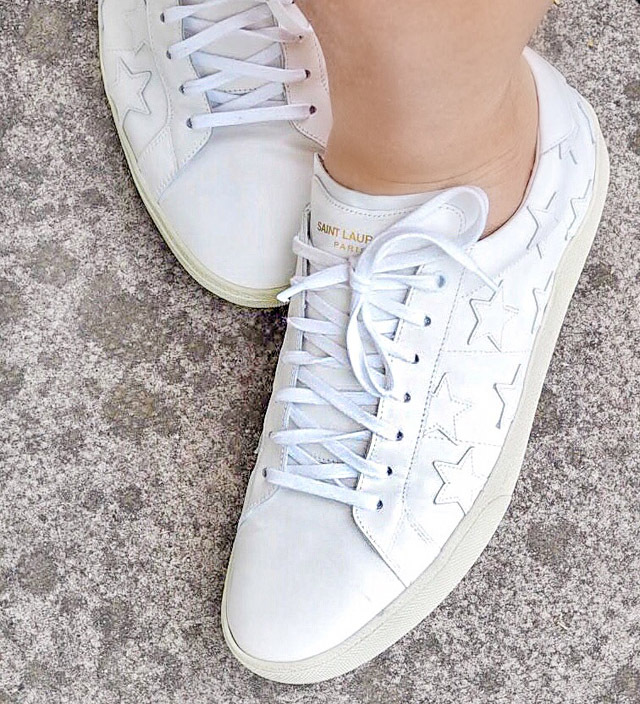 I challenged myself to wear these designer Saint Laurent star trainers, (purchased for an insane discount of 90% off) from Bicester Village, at least five times over the course of two weeks. This would bring the price per wear down to less than a daily sandwich value meal. So if I thought I wasn't feeling it, I wouldn't feel terrible about the purchase as it was an experiment worth conducting. However, I found myself pleasantly surprised by how often I was slipping them on. Rather than wearing them only five days out of the fourteen, I actually wore them for a grand total of ten! That's success, in my book at least. Anywho, I only captured five of the looks to share here today as I only had five days with a photographer scheduled to capture the outfits. 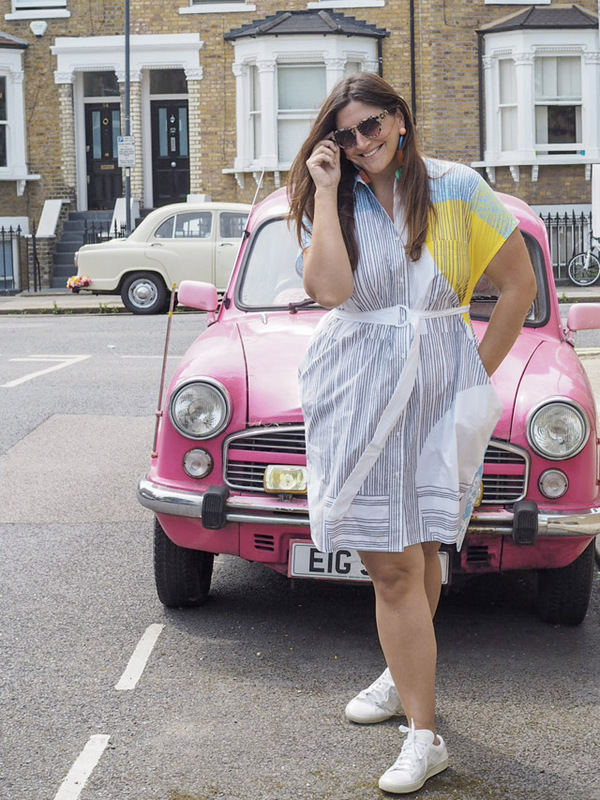 So without further ado, for anyone looking for ideas on how to wear trainers in their everyday life, here are five ways to wear the footwear trend taking the world by storm.... this is how to wear trainers for an everyday stylish life! Let's start with the first look, up above. Here you have your classic cream linen suit. It's a wardrobe essential and you'd usually find me wearing flat sandals or perhaps a kitten heel with this look. But, I reached for the trainers instead. It took the suit and it made it younger, edgier and more contemporary. I've also never been stopped so many times in my life with people complimenting me on my outfit. Who knew?! Trainers are the key! Let's keep it in the trousers family for a moment, as I feel this is where people are most comfortable when it comes to trainers. 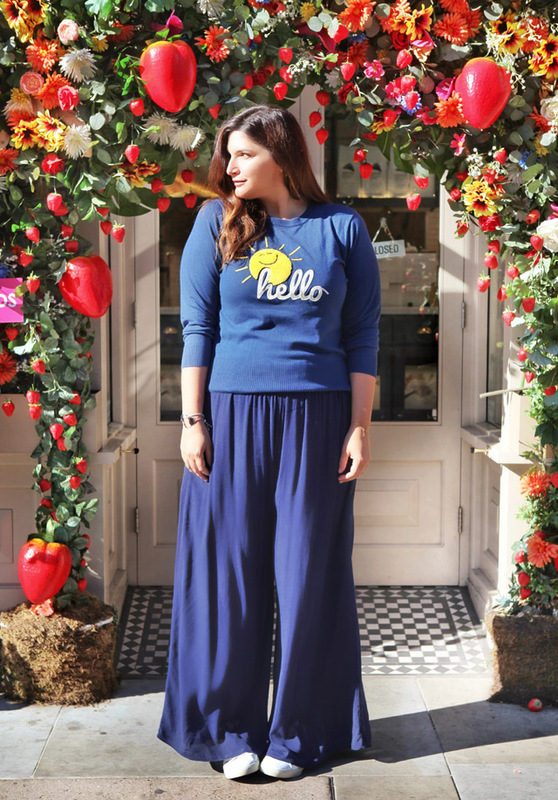 The look above features a pair of wide leg trousers, which work great with trainers. They should preferably be long so you just see the trainer peaking through. This is great for plain white trainers or a trainer with a bit of design flare that will just peek through in the outfit! It certainly has me smiling! Aw, but another option would be a skirt. 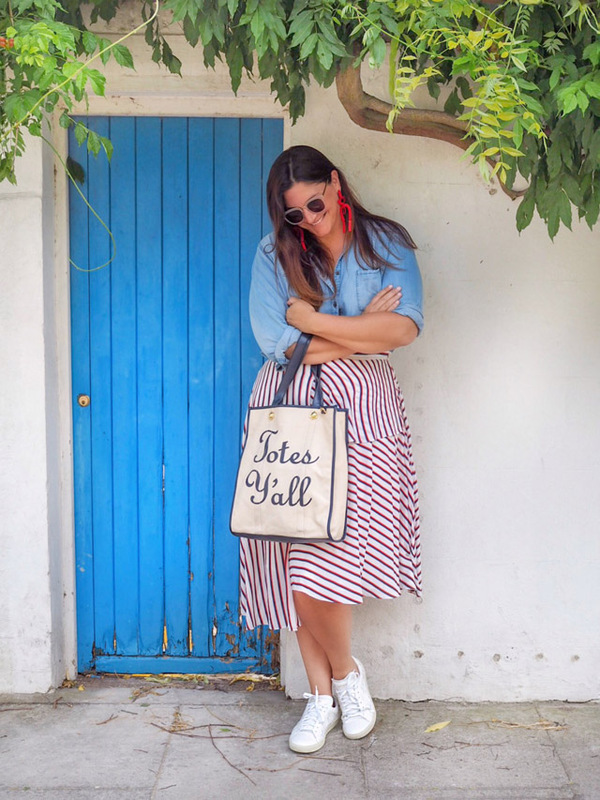 Yes, trainers work with skirts too. And this was my Fourth of July look. Come on, people. The shoes have stars on them... they were made for this holiday! I sported my red, white and blue proudly and my shoes were the hit of the fourth of July party. Everyone figured I had purchased them especially. Let's keep it our little secret. Now, last but not lease, let's talk seasonal crossover wear, as the summer, rather depressingly, can't last forever. Sad, but a reality, and I'm all about buying for the longterm, particularly when it comes to investment pieces. These trainers will take you into the chillier days, as we begin to layer again, with no problem. As we had a very chilly night, about ten days ago, I opted for a maxi dress and a layered sweater with the trainers. Easy peasy! The bottom line here is take some risks. 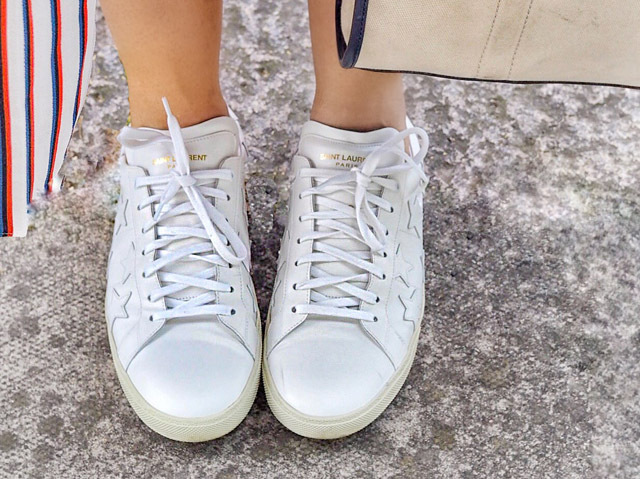 Find ways that trainers can fit into your wardrobe and buy them the way you would your Jimmy Choos. Look for ones that fit your style and personality and wear them as often as possible. As my mother would say... "your feet will thank you one day."